Bread is the thing we all miss isn’t it? Without a doubt I could face a lifetime of never eating doughnuts, chocolate or cakes but bread…. none of the keto bread recipes came close. 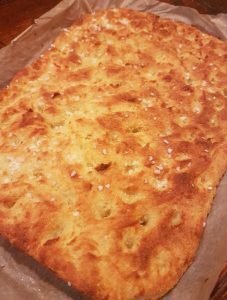 I’ve accidentally disovered, what I’m declaring to be, the BEST KETO BREAD. I wanted to make a fat head dough to have bagels, but I didn’t have enough almond flour left so I experimented a bit and discovered this recipe. I think it could easily become something like pound cake if you omit the yeast (which is completely optional anyway) and added some sweetener and some vanilla essence. I haven’t put this recipe in cups or tablespoons because it’s such an inaccurate measurement. 1 cup of coconut flour measured 100 times can easily never have the same weight. 50g of coconut flour is 50g always. I URGE ALL OF MY LOVELY AMERICAN KETOFAM TO BUY A KITCHEN SCALE AND EMBRACE WEIGHT. IT’S ACCURATE ALWAYS AND MAKES FOR MUCH BETTER BAKED GOODS. YOU WON’T REGRET IT. I’m also not giving you any macros because the ingredients that I used will most likely be different from the ones you use. Your coconut flour may have more carbs than protein than mine etc so if I tell you that your bread will have 3g of total carbs per 100g that’s a lie. You will need to work this out for yourself using the nutrition label on the ingredients you use. Start by preparing the yeast or what will ultimately be yeast flavoured water since we’re not using it for proving. Measure out a ¼ teaspoon. This isn’t even a gram of yeast so while the carb content might look scary, it is in fact, negligible in the end product. Pour over a teaspoon or so of warm water and leave it to dissolve completely. In a large bowl add the dry ingredients and mix well. Add the two eggs and make a dough. It will be on the dry side as the coconut flour absorbs a lot of moisture but don’t worry when it’s mixed with the mozzarella it won’t be too dry. Add the yeast water to the mix and combine. Melt the mozzarella in the microwave until it’s completely melted. Be careful to keep an eye on it because it if the cheese solids separate from the water you can’t fix it. I suggest doing it in 30 or 40 second bursts and mixing. Once it’s completely melted you will need to work fast before the mozzarella becomes too cool. Quickly, while the mozzarella is still hot, transfer it to the bowl with the dry ingredients in it. At this point the cheese will be too hot to handle so using the back of a dessert spoon knead the mixture as fast as you can. As the mozzarella cools you will be able to handle it. Quickly knead it with your hands as soon as it’s cooled enough to touch it. Did I say this all needs to be done quickly?! If the mozzarella cools too much it will stop incorporating the dry mix. If this happens put it back in the microwave for 15 seconds at a time. Once it’s fully incorporated you can now make the shape you want – bagels, rolls or a flat bread. To make the focaccia line a tin with baking paper and spread the dough out to 1cm thick. If you want a thicker bread use a smaller tin. Use your fingers to make indentations in the dough. Drizzle olive oil over the top making sure it settles in the finger holes. Liberally add rock salt. Bake at 180c for around 15 minutes but depending on the thickness of your dough times will vary. This dough is very versatile, you can add any mix or herbs or spices to it or leave out the yeast and add sweetener and cinnamon to make a cinnamon bread dough. There really are no limits!